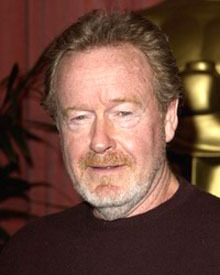 Sir Ridley Scott has been Oscar-nominated three times, for Thelma & Louise, Gladiator, and Black Hawk Down. He makes movies that look utterly authentic, as if cast and crew had filmed on location in a distant future (Alien) or ancient past (Kingdom of Heaven). In his early career, Scott spent a year making documentaries at Time-Life Books, then worked as a set designer at the BBC and directed occasional episodes of British TV shows, before starting his own company that made TV commercials. After fifteen years cranking out thousands of commercials, he was well-respected in that business, and even won awards. His most famous commercial, a 1984 Super Bowl ad introducing the Apple Macintosh computer, still commands an audience's attention. But eventually an itch to make something more substantial drew Scott to making movies. His first feature film, made for a shoestring budget, was the terrific sword-fighting adventure The Duellists with Keith Carradine and Harvey Keitel. His second film was the original sci-fi nail-biter Alien with Sigourney Weaver, and his next movie was the atmospheric future noir Blade Runner with Harrison Ford, now recognized as a classic but a box office disappointment in its initial run. Among his other successes, Scott made the riot grrrl road movie Thelma & Louise with Geena Davis and Susan Sarandon, the Roman drama Gladiator with Russell Crowe, the Somalian battle film Black Hawk Down with Josh Hartnett and Ewan McGregor, the intriguing con game Matchstick Men with Nicolas Cage, and the underrated medieval epic Kingdon of Heaven with Orlando Bloom. Years before his cinema successes, Scott's first effort as director was a short film, Boy and Bicycle, about the goings-on in a teenage boy's mind as he skips school and rides his bike. Scott's father held the microphone, his mother was briefly seen, and the boy on a bike was Tony Scott, Ridley's younger brother who became a successful moviemaker himself (Top Gun, True Romance). The brothers were co-owners of Pinewood Shepperton Studios, a British production facility where such films as Batman Begins and Gosford Park were filmed. When their mother died in 2001, the Scott brothers each gave her an on-screen dedication in their next films, Tony's Spy Game and Ridley's Black Hawk Down.